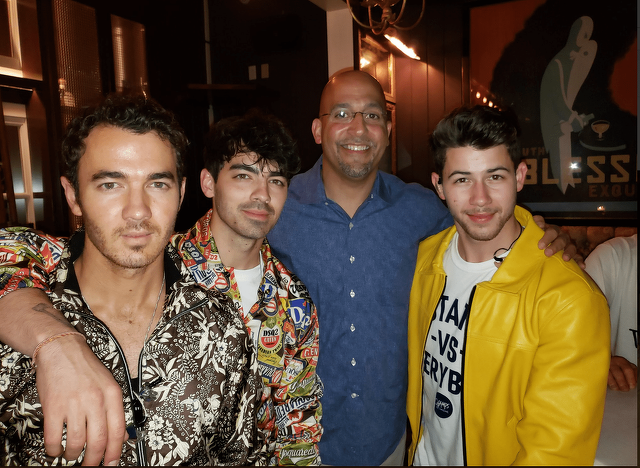 James Franklin poses for a photo with the Jonas Brothers at Champs Downtown in State College on April 5. STATE COLLEGE — After a day of rumors that it would happen, the Jonas Brothers played a surprise show at Champs Downtown on Allen Street on April 5. The band's visit to State College came after Joe Jonas spent the past few weeks leading the charge for Champs in the #BarstoolBestBar Twitter tournament. His band DNCE played an impromptu show at the bar in 2017, and his friends and former managers, State College natives, brought him to the Phyrst and Champs on North Atherton Street on his 21st birthday in 2010. The brothers arrived just before 10 p.m. at University Park Airport on a private plane, accompanied by each of their partners — Joe's fiancée, actress Sophie Turner; Nick's wife, actress Priyanka Chopra; and Kevin's wife, Danielle Jonas — who also made their way to Champs. They were introduced by Penn State football coach James Franklin, who also invited them to be on the sidelines for the Nittany Lions' White Out game this season. Their set began with the catchy classic “Year 3000.” They then went on to play “S.O.S.” — the first top 20 hit in Jonas Brothers history — and the two new singles, making it the first live performance of "Cool." The brothers kept the Penn State spirit alive and well with a short version of “Seven Nation Army” and plenty of “We Are” chants between songs, saying along the way that they didn't go to college, but if they did, they would have gone to Penn State. Their brief set ended with “Burnin’ Up,” perhaps their most iconic single, and Franklin returned to the stage to once again invite the JoBros to the White Out game. He also presented the brothers with football jerseys — white ones, of course — to wrap up the show. The Jonas Brothers thanked Champs for its hospitality on Instagram following the night’s action, and Joe went a step further by paying for an open bar for the rest of the evening.